Yes I know, its all about Brighton Pride. Can you blame me with the line-up of parties coming our way this most proud of weekends? Queenie and I are very chuffed to be part of Audio’s Pride Welcome Party with Horse Meat Disco. 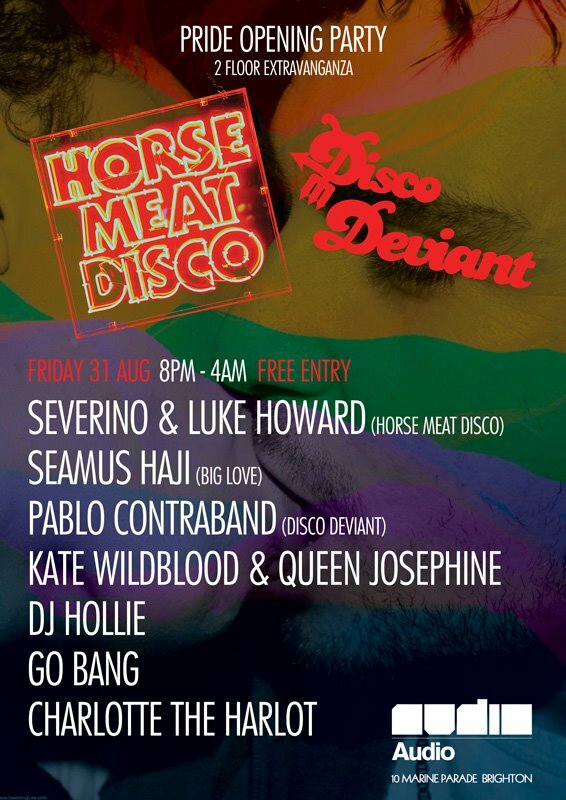 Oh yes all our disco dreams have come true at once as we get to share the decks with some of clublands finest including the aforementioned Horse Meat Disco (their national TV treasures don’t you know! ), Seamus Haji, Pablo Contraband, Go Bang, Hollie and Charlotte the Harlot. I’m moist just thinking about it. So that’s your Friday sorted then. DSD and then grab yourself a HMD welcome with me and the missus.